It’s not perfect, for sure, but this definitely falls into that “greater than the sum of its parts” mantra, and that’s something we can absolutely get behind. You know what's awesome about this motherboard? The heatsinks. Seriously, look at them: real heatsinks. OK, portions of them are covered in stylistic design elements, sure, but those are genuine fins there, capable of dissipating really hearty VRM thermal energy far better than some of the standardized aesthetic affairs we’ve been seeing for the last few years. Even though each generation of die shrink typically increases the number of transistors by 40 percent or more, the actual real-world performance increase has been more than lackluster in comparison. What this has lead to is the big chip manufacturers scrambling to get as much performance as possible by other means. Whether that’s through architectural changes, or more advanced technical measures (such as increasing core count through multiple dies), this has lead to a significant increase in overall power being pumped through the VRMs. More power means more heat, and eventually, especially when overclocking, this leads to VRMs throttling the amount of voltage they manage, to ensure they don’t breach their own thermal limits, which in turns slows down the processor. We’ve seen it with X299, we’ve seen it with Coffee Lake, and we’ve even seen it at the higher end of Ryzen—if you want the absolute maximum performance you can possibly get from your chip, having heatsinks that are, you know, actually effective is of paramount importance. But let’s get serious—this is the Aorus Gaming 7 Wi-Fi, Gigabyte’s finest X470 flagship. Aside from the glorious fins lining the VRMs, it comes packing absolutely everything the Taiwanese company could pitch at a board. We’re talking twin M.2 heatsinks, copious RGB connectivity and lighting, a premium DAC solution, dual eight-pin and four-pin EPS power, a 10+2 CPU power phase setup, eight PWM fan headers, a reinforced backplate, a whole host of internal USB headers, wireless A/C, and enough rear I/O to keep even the most avid USB enthusiast happy. If you can think of it, and it’s possible to fit it on the board, it’s here. Looking for more info before you buy a new motherboard? Check out our guide to the best gaming motherboards. All that frilly stuff aside, the Gaming 7 performs admirably where it matters. In our tests, it scored a solid 33.6fps in our x264 benchmark, and a stable 1,652 points in our Cinebench R15 multicore test. Power draw was on a par with our other top-end board, as were games. The only thing that was slightly down was the CrystalDisk QD32 sequential write speeds at 428MB/s versus the Crosshair VI’s (our comparative board of choice) 450MB/s. But all in all, a solid performance. Overclocking was not hugely different; we managed to hit our Ryzen 7 1800X’s limit of 4GHz across all eight cores easily enough at 1.425V on the VCore. That’s a little higher than we would have liked, with the Crosshair VI Hero managing it at 1.4V. That said, with the Crosshair, you do have access to power tweaker options, including VRM settings, which do make a big difference in such a situation. For high overclocks and extensive long-term load, that additional 10+2 power phase, combined with the VRM finned heatsinks and advanced EPS power setup, should make a substantial difference in keeping everything running smoothly. 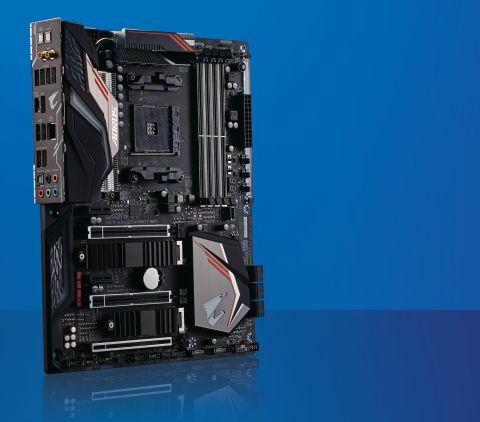 The X470 Gaming 7 Wi-Fi is a premium board, at a reasonable price, with a massive feature set. For anyone looking to get into streaming, rendering, or more, it’s the brilliant combination of form and function. It’s not perfect, for sure—Gigabyte still needs to do a lot of work with its BIOS and overall software design—but it definitely falls into that “greater than the sum of its parts” mantra, and that’s something we can absolutely get behind.